Tonight I am having a sit down Halloween dinner party, so that required some crafting on my part. I handmade the party invites. 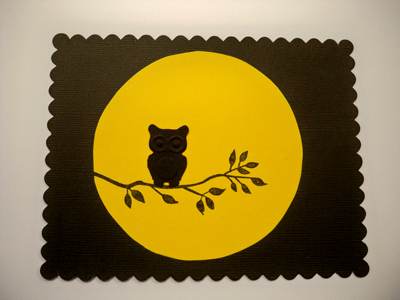 I used pre-cut black cards and added a moon with a stamped branch and a punched out owl. 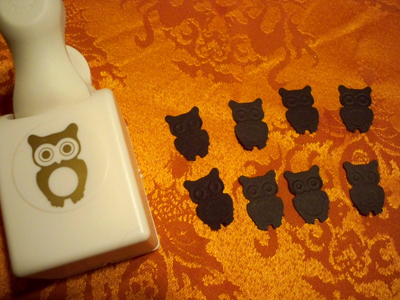 Was it an excuse to buy the Martha Stewart owl punch at Michaels? Perhaps. Look how cute! It even embosses the eyes! 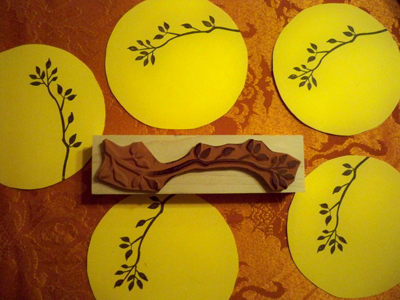 Aaron cut the moons out of yellow paper for me and then I used a branch rubber stamp to make a tree branch for the owl to sit on. Aaron then wrote the party details on the back with a white pen. 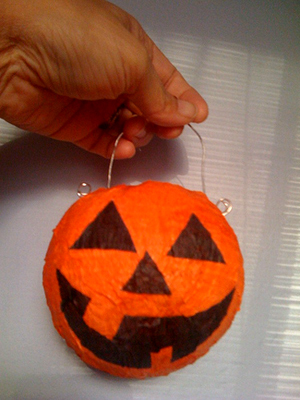 We also made paper mache pumpkins for favors. 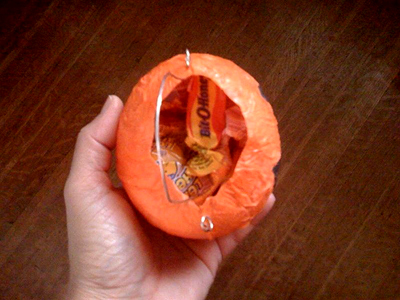 The pumpkins were filled with ye olde fashioned candy like Bit-O-Honeys. 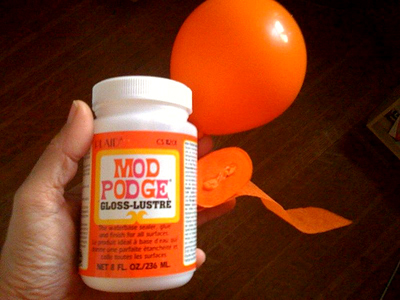 The pumpkins weren't hard... we covered balloons with orange crepe paper soaked in Mod Podge mixed with water. After they dried we popped the balloons and pulled them out. Aaron added wire handles and I added black crepe paper jack o'lantern faces. I was going to make one for each person, but they were more work than I anticipated so we made them larger... one for each couple. I've been reading your blog for 2 years now. And i really love all the crafts that u've created! Because i'm living in a small town in Malaysia, it's quite hard for me to look for the tools needed in making those crafts. Please continue crafting! I'm looking forward to seeing more craft ideas from u! I NEED THAT HOLE PUNCH! Very cute invitations. There was a great idea on the martha stewart website were you made a latex mold of your finger, then created plaster fingers to send out. Did you see it?